The tiny islet of Tabarca is becoming an increasingly popular day trip destination from Alicante or Santa Pola, with its quiet fishing village offering an old fort, several very reasonably priced fresh seafood restaurants, a rocky beach with clear turquoise water, and several coves and tidal pools ideal for bathing. Tiny and picturesque, Tabarca is the smallest permanently inhabited islet in Spain and can very easily be explored on foot. The islet is part of a marine reserve (Reserva marina de la Isla de Tabarca) and promises varied marine animals, clear unpolluted waters, and a healthy bird population. An artificial reef was planted near the island to further cultivate marine life. Formerly called Saint Paul's Island, in honour of the saint who is supposed to have made a landing here, visitors can still visit the Church of St Peter and St Paul, built in 1779. The island lies 10 miles (16km) south of Alicante and can be reached in an hour by ferry from the dock on Explanada d'Espanya in the city. 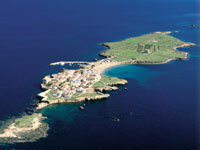 The island becomes crowded in the peak summer months but is still a charming destination.